. - Linear Logo Tank - Womens - Medium Grey Heather Soft lightweight fabric for superior moisture management. Loose fit. 50% recycled polyester/25% cotton/25% single jersey. Imported.
. - Square Neck Tank The perfect easy swing cami a modern high-neck silhouette. Made in our super soft jersey knit fabric. Adidas - At once classic and fresh the adicolor Tank top by adidas features a fun allover striped print an embroidered Trefoil ruching details on the shoulder straps a round neck and a comfortable regular fit. Vans - Classic Tank-Top - Boys Grade School - Black/White You can't go wrong with the Vans Classic Tank. This tank top will have you feeling cool and comfortable from beach to poolside. Classic Vans logo at chest. Classic fit. 100% cotton. Imported. 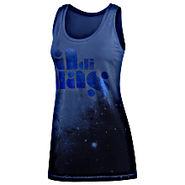 Puma - Xtreme Crop Tank - Womens - Plate Blue For warm weather style nothing beats the Xtreme Crop Tank from PUMA. Features PUMA logo pigment print. Piping details. 77% polyester/23% elastane. Imported.